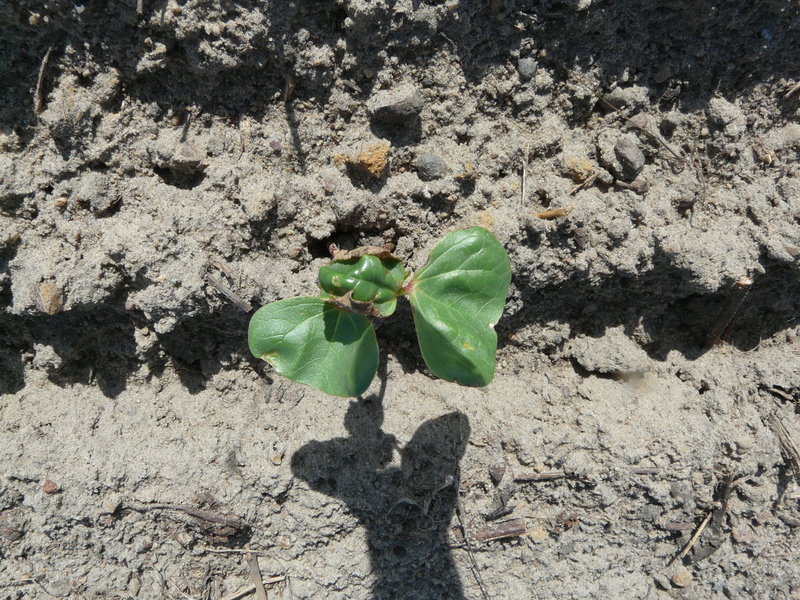 Cotton is anywhere from just planted to cotyledon to 4 leaf at this time. Recent rains have growers planting and we hope to have more this weekend. It’s past our thrips date of May 10th and we have reason to believe thrips may crash soon this year – since we had a warm winter, they were active sooner. But remember, thrips live in the winter weeds along roadsides and move to our cotton and peanuts following germination. From 0 to level 5, I’m seeing damage from none to about level 3, sporadic in most fields. Neonic seed treatments (imidacloprid, thiametoxam) are active on thrips for up to 14 – 21 days after planting. If we have no seed treatment, we need to be in the field checking the first true leaf. This is the best time when we need to apply a foliar application. Once we have 4 true leaves and the plant is growing fast, thrips foliar sprays are not economical. Research has shown that foliar applications are still needed when thrips infestations are high. The best way to make this decision is based on current threshold of: 2 – 3 thrips per plant AND/OR presence of immatures. The immature (wingless) thrips will be yellow/green in color; the adult (winged) thrips are black. Take a white piece of paper and slap a plant on it. Give it a second for the thrips to start crawling. In this field, I have immature thrips present. This suggests are at-plant insecticides are no longer active, and reproduction is taking place. Should we follow with a second acephate spray? Dr. Roberts has conducted trials with 1 +3 leaf sprays, and they showed no difference from a 1 leaf ONLY spray. Something I noticed rating our thrips trials (2016) is not only the effectiveness of 1 leaf sprays, but also how fast the plants grow in 14 days. If we have a timely insecticide spray, AND growing conditions are good, cotton will outgrow potential thrips issues. The only reason to consider a second foliar application is if 1) cotton is not growing fast 2) thrips are still highly active. It would be a judgment call at best. We were able to plant our variety trial last Friday. I visited the field today, and cotton is just now coming up. The field is at the end of Centennial Road where it touches Airline Road. It is the one on the right. 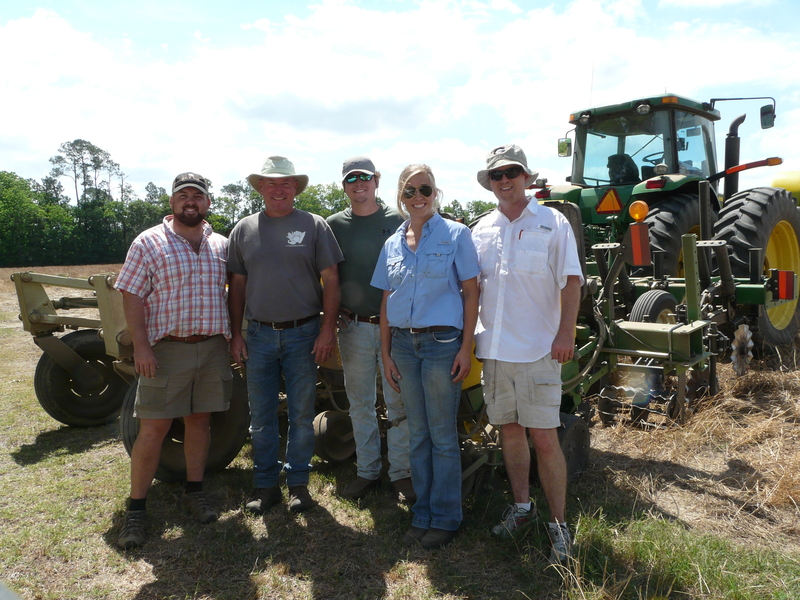 We ended up participating in the UGA On Farm Variety Trial. Most of the varieties I asked for were in the trial. We were able to get in all varieties I wanted plus these for a total of 15. We replicated three times in the field; reps are actually stacked on top of each other. We got done real fast, thanks to Brandon’s precision planting. 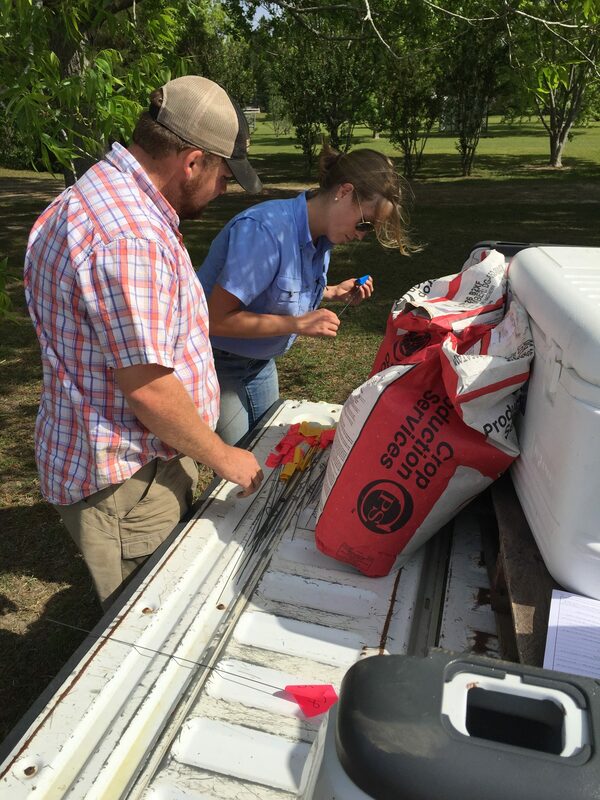 Thanks to growers Mike, Brandon and Chandler Barnes for planting the trial this year and Jodie Stringer (Boston Gin) for helping and Jessica Jones, owner of Barbaritoes, for feeding us in the field.